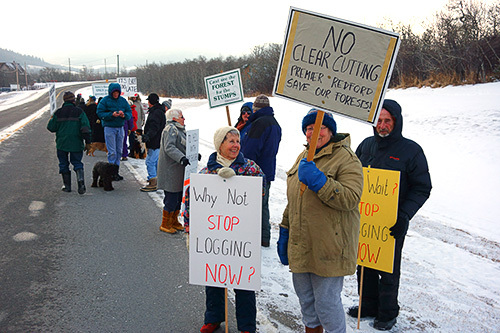 Despite the generally grey January skies, there was a festive feeling in the air as friends, neighbours, and defenders of wilderness and wildlife got together to rally against clear-cut logging in the Castle Special Place. 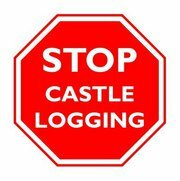 And even though the feeling was friendly, the participants remain resolute in their determination to have clear-cut logging stopped once and for all in the Castle. 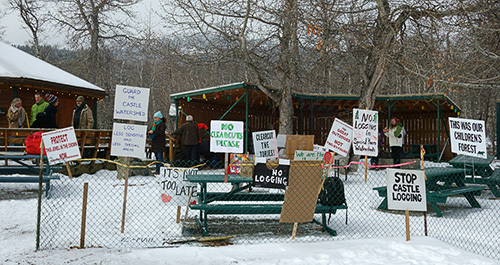 Many of those carrying signs were veterans of similar rallies in the past, including the demonstrations that lasted for three bitterly-cold weeks last January. Hats off to these determined folks, and to their continuing and spirited defence of the Castle, and of the wild things that live there! This entry was posted on Monday, January 21st, 2013 at 12:17 pm and is filed under Uncategorized. You can follow any responses to this entry through the RSS 2.0 feed. You can leave a response, or trackback from your own site.